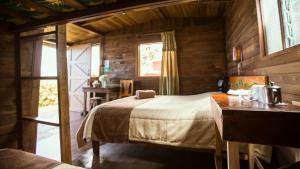 ﻿ Best Price on Cabinas El Quetzal in San Gerardo de Dota + Reviews! 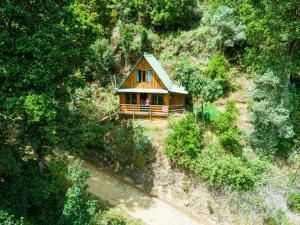 Offering a children's playground and terrace, Cabinas El Quetzal is located in San Gerardo de Dota. Manuel Antonio is 27 mi from the property. Free private parking is available on site. The accommodations is equipped with a flat-screen TV with satellite channels. Some units include a seating area and/or terrace. A mini-bar and coffee machine are also available. Every unit features a private bathroom with a bath or shower and free toiletries. Bed linen is offered. Guests can enjoy the on-site restaurant. The property also offers packed lunches. You can engage in various activities, such as horse riding, cycling and fishing. Playa Hermosa is 19 mi from Cabinas El Quetzal. The nearest airport is Tobías Bolaños International Airport, 35 mi from Cabinas El Quetzal. Please let the property know the ages of children at the moment of booking. Please inform Cabinas El Quetzal of your expected arrival time in advance. You can use the Special Requests box when booking, or contact the property directly using the contact details in your confirmation.